Tiger Selfies Aren't Just Stupid, They're Cruel. Here's Why. Little Maximus was at the center of a recent and disturbing investigation into tiger cub facilities by the Humane Society of the United States (HSUS). These facilities - colloquially referred to by animal advocates as "Pay to Play" - are places people can visit to pet, play or pose with exotic tiger cubs for a fee. From May to September of 2014, HSUS investigators went undercover at Maximus's home, Tiger Safari in Oklahoma, which offers tiger cub interactions to the public. HSUS investigators allege that Maximus - who was photographed with the public beginning at 3 weeks and 2 days of age - was dragged, smacked, punched, choked, tossed and suspended by his tail by employees at Tiger Safari during that time period (click here to watch a video and also read the HSUS report). The owner of Tiger Safari described the investigation as "propaganda" to a local Oklahoma television news station. The company has not returned emails from The Dodo. But HSUS officials say the goal of the inquiry was to document what really happens behind the scenes at Pay to Play (PTP) facilities, according to Nicole Paquette, vice president of wildlife protection at the organization. "We knew it was bad," she told local outlet KFOR.com, "but we had no idea about how bad it actually was." In fact, the cruelty of PTP lasts for years, say advocates. Not long after they've stopped being small enough to "play" with, some tiger cubs are eventually shoved into breeding operations. Some languish at appalling roadside zoos. Some end up in private menageries. Many simply disappear. No one can be totally confident about what the fate is for cubs like Maximus: It's a dark and disturbing mystery. Captive tiger mistreatment begins when cubs are born, say advocates. "The abuse begins when the cubs are prematurely and forcibly separated from their adult mothers - usually during or immediately after birth - depriving them of normal biological and behavioral development," Lisa Wathne, captive wildlife specialist at HSUS, told The Dodo. From that point forward, she says, "rather than experiencing the warmth of their mother and interacting with their siblings, the cubs' lives are dictated by the demands of the paying public." After that, cubs are very quickly "subjected to excessive handling," she notes, which in turn means their feeding and sleep cycles are disrupted. At Tiger Safari, for example, a 3-week-old cub named Sarabi - after being driven by car 19 hours from a breeding facility in South Carolina - was handled by 27 individuals during the course of one day, claims HSUS investigators. Cubs are often diseased, live in inappropriate housing and are fed inadequate diets. And unsurprisingly, HSUS found, they are physically disciplined in order to get them to "cooperate" for photo shoots. In fact, Carole Baskin, founder of Big Cat Rescue in Tampa, Florida - the largest accredited sanctuary in the country dedicated to rescuing abused or abandoned big cats - maintains that the abuse cats endure in PTP cannot be overestimated: "Pay-to-play is the driver of 99 percent of the big cat abuse in this country," she says. Since its inception, Big Cat Rescue has been monitoring the PTP industry as best it can. The organization provided The Dodo with some of its research. In one case, a tiger cub at a PTP facility was electrically shocked during training when she wasn't complying with the owner's instructions. According to the notes, when she still failed to heed demands, the shocking device was rammed down the cub's throat. A review of data supplied by the USDA to The Dodo showed some 2,000 tigers living in USDA-accredited facilities across the country. According to Tigers in America, a captive tiger monitoring group, there are some 7,000 captive tigers in the U.S., including those in zoos, sanctuaries and private ownership. Wathne says approximately 84 U.S. facilities provide public handling of tigers cubs - click here to read the landmark petition filed by HSUS, Born Free, the International Fund for Animal Welfare (IFAW) and other groups that would like the public handling of cubs banned. At PTP facilities, the tiger cubs are handled by the public when they are very young - approximately 8 to 12 weeks, although there's no regulation restricting that time period, says Tanya Espinosa, public relations specialist at USDA. "Big cats younger than 8 weeks are more fragile and susceptible to disease and overhandling, and big cats older than 12 weeks begin to be too big and active to be safely handled by the public," she explains. The USDA inspects facilities on average once a year, says Espinosa, but this isn't a requirement. However, she adds, "Any handling of big cats younger than 8 weeks or older than 12 weeks will be much more highly scrutinized by our inspectors." What happens, then, when a tiger reaches 12 weeks, or after he's lost his public appeal? Where does he go? That's up to the facility, Espinosa answers. She adds that the Animal Welfare Act requires that facilities maintain records of who obtains the animal, "and the inspectors check those records during the inspection process." "No agency, either state or federal, tracks all big cats," confirms Laury Parramore, public affairs officer at the U.S. Fish and Wildlife Service (FWS). Some big cats, she explains, fall under the jurisdiction of FWS, and others fall under the USDA/APHIS. This broken system of oversight means that the future for many tigers is speculative: "A few of [the tigers] might stay at the facilities that use them in PTP, and if that's the case, they are usually shunted off into a concrete and chain-link type enclosure where they spend the remaining years of their long lives," says Wathne. Tigers typically live 10 to 12 years in captivity, according to Baskin. It costs thousands of dollars a year to feed them. Baskin says many tigers land at unaccredited zoos, which are frequently cited by the USDA for inadequate veterinary care and housing. But some end up in even more dire situations: One former PTP cub, she found, was sent to a facility that previously euthanized a cub by slitting its throat. Another former PTP cub was sent to a facility that had previously owned tigers "which were missing toes and feet from botched declaw jobs, and that one had been hit so hard in the eye that part of her skull had to be removed." Some of the tigers are simply recycled into the system and used to breed more babies. During the the HSUS investigation at Tiger Safari (along with the troubled Natural Bridge Zoo in Virginia), for example, 12 tigers who were born at both facilities were sent to The Institute of Greatly Endangered and Rare Species (T.I.G.E.R.S.) in Myrtle Beach, South Carolina. T.I.G.E.R.S is another well known PTP facility that often comes under fire from animal welfare advocates often associated with breeding cubs for PTP. Baskin says that in order for PTP facilities to stay afloat, they must have a steady, replenished flow of young tiger cubs. Big Cat Rescue estimates that more than 200 tiger cubs are born in facilities each year, "based on the images we find on Facebook, YouTube and Flickr." Another concern of advocates is that the tigers may be killed and their parts sold into the illegal wildlife trade. However, this has yet to be buoyed by much data thus far. TRAFFIC produced a report in 2008 on the captive tiger trade in the U.S., and found no evidence that parts or products from U.S. captive tigers were entering the global trade. And Tim Van Norman, chief of the branch of permits in the Division of Management Authority at FWS says, "Within the U.S., I am not aware of any evidence to show that captive-bred tigers were being traded or killed for the black market. That is not to say it has not or would not happen, just that I have seen nothing specific. " However, the TRAFFIC report also noted that because there is a lack of oversight in the U.S. of the captive tiger industry, U.S. tigers could be vulnerable to the black market if tiger farming in China, especially, became legalized. 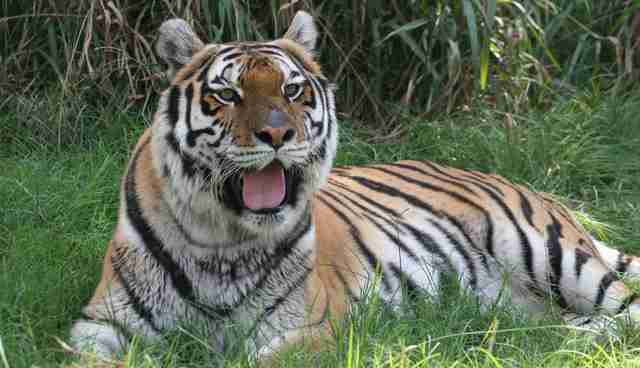 In fact, according to some experts, the breeding of tigers in China is already thriving. Some former PTP tigers ultimately land at a legitimate sanctuary, like Big Cat Rescue or The Wildcat Sanctuary in Sandstone, Minnesota. But these are the "lucky" ones, stresses Tammy Thies, founder and executive director of The Wildcat Sanctuary. Wildcat is home to 10 captive tigers, who still show signs of physical or emotional abuse from life in PTP, she says. A striking white tiger named Nikita arrived at the sanctuary in 2012. Nikita was formerly used for photos ops in a PTP facility, claims Wildcat. "The day we brought her to the sanctuary, the International Fund for Animal Welfare put up a GoPro camera on a fence," explains Thies. "GoPros are tiny. They aren't big. And Nikita was able to spot this camera out on the fence, nevertheless." What did Nikita do to the camera? "She attacked it." It's been three years since the tiger's arrival and Thies says "we still do not allow any flashes around Nikita." While Wildcat does not allow public tours, its employees take photos through telephoto lenses from 50 to 100 feet from the animals. Wathne, Thies and Baskin all agree that animals continue to suffer in the mysterious black hole at the center of the captive tiger industry. They argue that until a multitude of issues are addressed- USDA funding for effective inspections, substandard facilities being shuttered immediately, and the lives and welfare of animals being taken as seriously as they should - the climate will remain grim. And although some tigers may be well-cared for in certain operations, it's just as likely, Wathne says, that a tiger "could be killed and buried on someone's back lot - and no one would ever know." In the meantime, as for the tiger cub Maximus, who is now long past 12 weeks of age, HSUS officials told The Dodo they believe he is still at Tiger Safari in Oklahoma. CORRECTION: A previous version of this article stated that Wildcat is open to public visits. It is not, but the public can view the sanctuary through virtual tours.